This final book in the Starcatchers series was an afterthought by the authors, written at the request of readers who weren’t satisfied with a trilogy. It’s crafted with the same humor and style, but it takes place twenty years after the others and, incidentally, one year before Mr. Barrie published his classic Peter Pan play on which the Starcatchers is based. Molly is all grown up, the original Lost Boys are aging, and “when the starstuff falls stopped, the group you knew as the Starcatchers gradually ceased to exist. Essentially there are no more Starcatchers anymore.” So no one is prepared when strange events begin to surround the coronation of King Edward. Lord Ombra, our friends learn, has resurrected and is intent on capturing the last two starstuff catches on the planet. Fortunately, Peter is still as young and spry and magical as ever. He just has to be convinced to leave his island, which has troubles of its own. I really like how this one moves us out of the Age of Sail and into the Industrial period in which the play and original novel are set. Hook has become rather quaint and out-of-date. An old school pirate who, in one humorous scene, ineffectually tries to overpower a modern steamship. I also like how Molly and George, especially George, have transformed into the parents from the classic, personalities and all. The prequel has reached its end. The Sword of Mercy introduces Wendy, Michael, and John and takes us all the way up to the rap on the nursery window. Of course, after the adventures in this book, the children already have a history with Peter, so it doesn’t quite jibe with the introductions in Peter and Wendy. 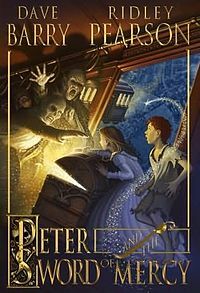 And because of the maturing Peter has undergone in the Starcatchers adventures, he possesses a much deeper, more complex personality than we see in the original. I have to warn readers that Peter and the Sword of Mercy, like the others, contains some very dark, evil characters. And Ombra isn’t the worst of them this time. The Skeleton is a disfigured creature that relishes inflicting pain on his victims. There’s also a rather gruesome electrocution scene, the matter of Ombra possessing a man, and a resurrected corpse. Because of this, I’d give it a 12+ age ranking, one slightly higher than the others. Have read your other reviews in this series. The final book sounds like it bring a closure closure of sorts. Someday I’ll have to check out thes books. Always loved Peter Pan. They’re not very deep, but they’re a lot of fun.